Во-первых, давайте уясним, что этот курс, в отличие от других, это еще не вся теория. Курс о прослушивании аудио на наших примерах, узнаете, что делает хорошую запись, поймёте как все может пойти не так, как сделать свои собственные записи и иметь возможность получить их. We have included everything you need to know, and we've left out anything you don't need to know. Music Production and Sound Engineering are exciting things to do. Our 600+page online Course Manual will help you learn in an exciting way. You can complete your entire course in as little as twelve weeks. Or you can spread your course out over as long as two years if you wish. Learning Music Production and Sound Engineering by distance learning is totally flexible in this way. Many of our students like to download and print the course manual, normally in two volumes. The course includes downloadable artwork. 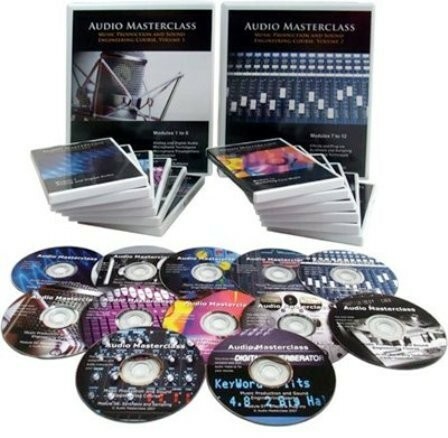 All of the audio material is delivered to you online to load into your digital audio workstation (you can use a software or hardware workstation). Each module contains not only Audio Example Files demonstrating the material covered in the online Course Manual, but also audio material demonstrating the Practical Assignment Project for that module. You get to hear work done to a professional studio standard, and also some less-than-perfect recordings so that we can show you how things can easily go wrong, and explain how to avoid these problems.